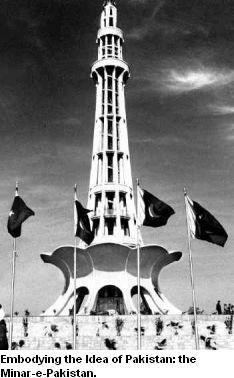 Jinnah's Lahore address lowered the final curtain on any prospects for a single united independent India. Those who understood him enough know that once his mind was made up he never reverted to any earlier position realized how momentous a pronouncement their Quaid-i-Azam had just made. The rest of the world would take at least seven years to appreciate that he literally meant every word that he had uttered that important afternoon in March. There was no turning back. The ambassador of Hindu-Muslim unity had totally transformed himself into Pakistan's great leader. All that remained was for his party first, then his inchoate nation, and then his British allies to agree to the formula he had resolved upon. As for Gandhi, Nehru, Azad and the rest, they were advocates of a neighbor state and would be dealt with according to classic canons of diplomacy. - Stanley Wolpert, Jinnah of Pakistan. 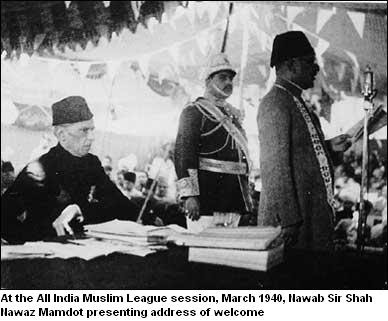 The British had been compelled to recognize the Muslim League as the sole representative of the Muslims of India by 1940 and Quaid-i-Azam Mohammad Ali Jinnah as its undisputed leader. Time and Tide of London published an article by Jinnah on January 19, 1940 under the caption "The Constitutional Future of India". He maintained: "Democratic systems based on the concept of a homogeneous nation such as England are very definitely not applicable to heterogeneous countries such as India." He called the Hindus and the Muslims "two different nations" with different religions and different social codes. 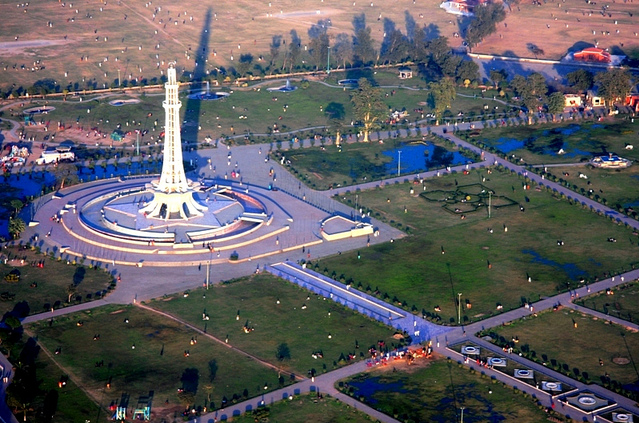 It is obvious that by calling the Hindus and the Muslims two nations, Jinnah had reached the threshold of partition, but he was still reluctant to abandon his lifelong dream that Hindus and the Muslims would come to an understanding and in unison make "their common motherland " one of "the great countries of the world". 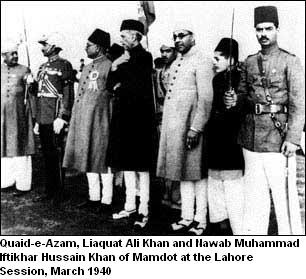 The Quaid-i-Azam crossed the barrier at the Lahore session of the Muslim League in March 1940. He traveled to Lahore from Delhi in a colorfully decorated train on which green flags were mounted, bearing the emblem of the Muslim League: the crescent and star. "The Hindus and the Muslims belong to two different religions, philosophies, social customs, and literature. They neither inter-marry, nor inter-dine together, and indeed they belong to two different civilizations which are based mainly on conflicting ideas and conceptions. Their aspects on life are different. It is quite clear that Hindus and Muslims derive their inspirations from different sources of history. They have different epics, their heroes are different, and they have different episodes. Very often the hero of one is foe of the other, and likewise, their victories and defeats overlap. To yoke together two such nations under a single state, one as a numerical minority and the other as a majority, must lead to growing discontent and the final destruction of any fabric that may be so built for the government of such a state." The session began with Nawabzada Liaquat Ali Khan presenting the annual report on March 23, 1940. After the report, Maulana Fazlul Haq from Bengal, moved the famous Lahore Resolution, better known as the Pakistan Resolution, "…the areas in which the Muslims are numerically in a majority as in the North-Western and Eastern zones of India should be grouped to constitute 'Independent States' in which the constituent units shall be autonomous and sovereign." 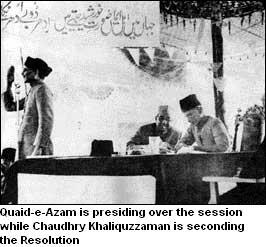 The resolution was seconded by Choudhry Khaliquzzaman who gave a brief history of the causes which led the Muslims to demand a separate state for themselves. Maulana Zafar Ali Khan, Sardar Aurangzeb Khan, Sir Abdullah Haroon, Nawab Ismail Khan, Qazi Mohammad Isa and I.I Chundigar supported it, among others. 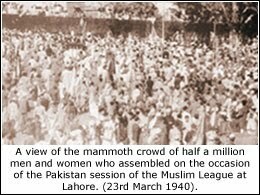 The resolution passed in Lahore on March 23, created a scare in the minds of the Congress and the Hindus. 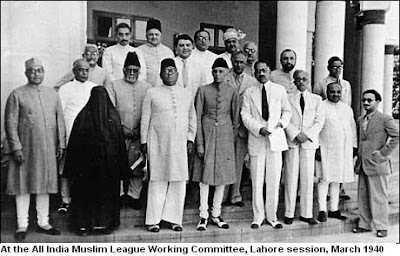 They could see that the Muslim League had now openly advocated the division of India into "Independent States." 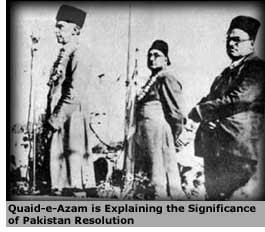 The Quaid had anticipated the Hindu reaction and had taken organizational steps to face the opposition of the Hindus. He himself set an example of calm courage and an iron determination to lead the Muslims to their cherished goal of freedom. The Pakistan Resolution released the potential creative energies of the Muslims and even the humblest amongst them made his contribution for the achievement of Pakistan. 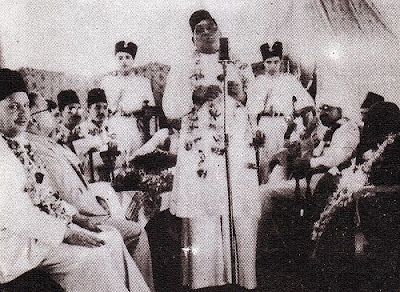 The Quaid knew that without a well-defined goal that could be understood even by the simplest Muslim, there could be no real awakening of the Muslims. 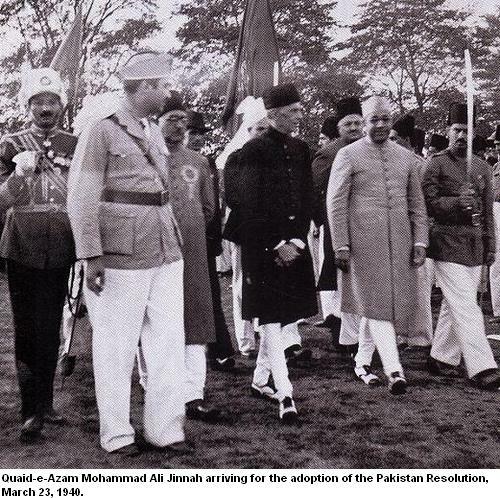 The Pakistan Resolution gave them a legible, objective and reachable goal: Pakistan.